Doogee’s global marketing manager, Allen He, shared an image of a new screen concept showcased by China’s biggest display company BOEat the SID Display Week 2018 in Los Angeles. The concept shows a circular cutout for the selfie camera within the display area. The screen is taller than the current immersive displays is similar to the iPhone X‘s “inspiring” design. Tipster Ben Geskin designed a digital concept of smartphonesusing this display. There is no guarantee that smartphones will use such displays any time in near future but the idea is certainly fascinating. 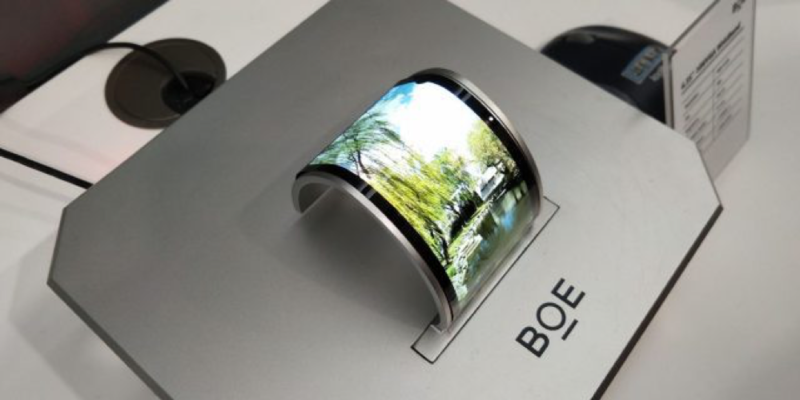 Along with this concept, BOE also boasted a range of flexible AMOLED displayswhich can have a variety of applications ranging from billboards, displays on robots, displays for car dashboards, or smart speakers and other solutions like Google’s smart displays. These displays have abending radius of merely 1 mmand can be bent over 100,000 times, BOE says. The company also showcased an OLED display designed specifically for ARapplications. The tiny 0.39-inch display has a high pixel density of 5,644PPI. This super-rich display enables a seamless transition between digital images and real-life scenes. Notably, BOE has been trying to woo Apple since last year to provide OLED displays for the iPhone X. It even sent a multi-billion dollar proposalto Apple for the displays and shared its plans of preparing its assembly lines for the iPhone-maker. While there is no confirmation regarding the unlikely use of BOE’s in this year’s iPhones, the idea of seeing iPhones with the aforementioned displays is enthralling. Last month, Huawei indicated it could release a foldable smartphone before the end of 2018. A new report claims Huawei has partnered with BOE to make its foldable smartphone a reality. The foldable smartphone has an 8-inch display, according to the South Korean website ETNews. Huawei’s goal is to unveil its foldable smartphone this November. BOE’s sixth-generation flexible OLED Fab has yet to produce a commercial product, so going from scratch to foldable displays seems like quite a stretch (figuratively and literally). BOE, at the SID Display Week expo showed a prototype foldable display at its booth. The company also announced that it would showcase a foldable smartphone with a 5.99-inch display and a foldable tablet with a 7.56-inch display. “The foldable all-screen WQHD AMOLED display launched by BOE can achieve minimum dynamic bending with a radius of only 1mm. It has been tested more than 100,000 times and has an NTSC color gamut up to 118%, in a press release. BOE said it is also working on four foldable phone designs for two other companies. Huawei’s plan to unveil its foldable smartphone in November is said to be a conscious decision so that it could beat Samsung to the punch. The other company that BOE might be working with could be Xiaomi or Oppo, both of whom have already filed patents for foldable devices. Other potential partners of BOE are Lenovo and ZTE, since they have already experimented with flexible displays, as pointed out by GSM Arena. Tianma also showed a foldable display in their booth and mentioned that they are also collaborating with Huawei.